Mark first ventured into the ocean under-world in 1975, during his university years. He graduated as a dentist in 1977 and began taking photographs underwater in 1978. Since that time, Mark has been published in many major journals, including National Geographic, Australian Geographic, and BBC Wildlife magazine. His assignment to photograph manta rays for a major feature on that animal won him Australian Geographic’s “Best Photographer” award for 2002. In 1997, he was elected a Fellow International of the Explorers Club in New York. 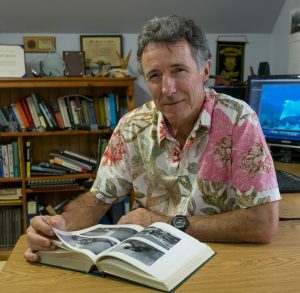 This honour mainly reflected his efforts to document various diving projects with respected journals such as Sportdiving magazine and Australian Geographic. His subject material covered shipwreck exploration, marine wildlife and cave diving. In 1997 and 1998, Mark led an Australian contingent on two expeditions to Turkey to examine the alleged discovery of the Australian WW1 Submarine AE2. This project received Government imprimatur with some financial assistance from the Royal Australian Navy. In 1998, his team confirmed the wreck as indeed the AE2 – lying at a depth of 72 metres – and a full report of this project had been submitted to appropriate Government and Defence departments, as well as major maritime museums and archaeological establishments. He was involved in the planning of the return maritime archaeological expedition to the AE2 submarine in 2007. In 2007, Mark was honoured by his peers in the diving community at an Australian Diving Technologies Conference with an “Outstanding Achievement Award” for his “Outstanding contribution, commitment & success in underwater photography and in cave & wreck exploration”. In 1981 Mark learned the Transcendental Meditation technique and in 1985, the TM-Sidhis advanced meditation technique. The incorporation of meditation into his daily routine allowed him to experience the peaceful silent depths of consciousness not normally entertained at the superficial levels of wakefulness. He quickly recognized the qualities of consciousness experienced in meditation reflected those qualities he experienced in his deep-sea diving. The correlations deserved their own exploration and after years of research, the book Ocean of Self examines the nature of consciousness using the ocean as a metaphor. Why did Mark write this book? “This book – which I describe as my ‘magnum opus’ – has been a concept for 25 years. I attempted to write chapters of the book almost as long ago, but found it difficult to bring a coherent structure to the book. I now believe that I was still accumulating knowledge and experiences – right up to the present time – that was vital for my message to have any hope of coming across. Why then did I attempt this book? One way to better understand experiences in life that might otherwise defy easy explanation, is to research the subject as best you can and write it down. As I wrote this book – and in the process carried out what research I needed – I found that I better understood my life experiences. In teaching, we learn! So in some ways, it could be said that writing this book was my own way to better understand the correlation of experiences I had as an ocean explorer and a regular meditator. But I also wanted to share my knowledge and experiences with others who might be asking the same questions – what is ‘consciousness’ and can we exercise it? Can we develop our consciousness and become even more aware, more intelligent and more comprehending of the world around us? Can we better understand our spirituality through the exploration of consciousness? Where does God fit into the scheme of things? What happens when we die? If we tried to tackle these big questions through the intellect alone, we just might miss out on the joy and fun of life – life’s spontaneity. But if we attempt to better understand consciousness and also become an explorer – a diver – in that ‘ocean of consciousness’ underlying our small waves of consciousness, then I am adamant that life will be more joyous, more fulfilled, more understanding and tolerant, more loving and more peaceful.